Pacific Northwest Coast Native masks are mainly used for ceremonial purposes. The native masks often represented spirit creatures, animals and myths. When used in the Potlatch or other West Coast Native ceremonies, the native dancers would take on the personification of the creatures that the masks represented and enter the supernatural world during the dance. 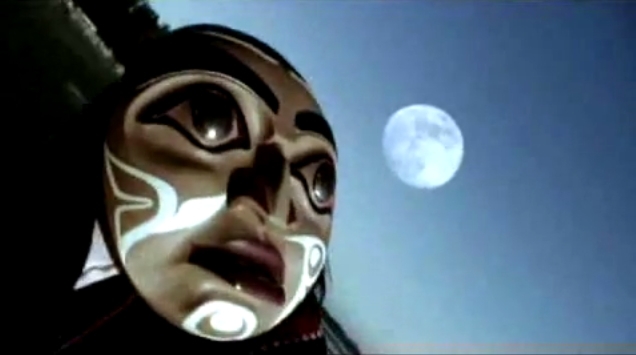 A West Coast Native transformation mask often represents the transformation of a human to a mythical creature or animal and vice versa. A full moon inspires awe and wonder in all those who gaze at it. Long before recorded history, cultures around the world were charting the moons path across the night sky. Its perpetual waxing and waning, vanishing and reappearing, marked the passage of time - not clock time, but the cycles of life; the ebb and flow of the sea; the birth, maturation and migration of animals; the sprouting of new plants and the scattering of seeds. Unlike the sun, the moon does not blaze its power upon the earth. It is subtle, more receptive and reflective. The moon brightens the darkness and is therefore a powerful guide or protector. As the force that rules the tides, it is strongly linked to water. The moon is a sacred symbol that appears in countless Native American. These ancient cultures often carved masks to express the intimate relationship between the invisible forces and spirits above, as well as the people, animals, plants, rocks and earth below. Responses to "West Coast Native Grandmother Moon Mask Ceremony "